I am not immune. The holidays mean movies, and I thought I’d begin the season by indulging in the massive promotional juggernaut that is Anchorman 2. I expected it to be silly and stupid. But racist too? That caught me by surprise. And it didn’t make me go har-har-har. We all know silly and stupid can be funny, and who takes that seriously? I don’t. In fact, I found myself nodding my head as I listened to one of the movie’s co-stars, Steve Carell, the maybe dead weatherman, plugging the film on Howard Stern the other day, dismissing it all. “All idiots doing stupid and dumb things,” said Carell. But that doesn’t give the producers license to be racist. True, racism is a form of ignorance. And that’s different from the kind of put-on silliness and stupidity that is the bread and butter of Anchorman 2. Except in this one instance. Racism, after all, isn’t a form of comedy. Otherwise the KKK would be right up there with the Keystone Cops. Mind you, I didn’t go to the movie on a press comp. I paid my hard-earned cash, went willingly to the movie, and sat through all of it (nearly two hours). Indeed, as a former local TV anchorman in Washington, D.C. in the 90’s, who knows all about banter and hairstyles, pancake make-up, and sitting on phone books to achieve “elevation,” I was prepared for it all. I even relished how the “team” celebrated their success by getting perms! But in the first 15 minutes, there was one jab that crossed the line. I was so irate by the line that I tried desperately to find a pen and scribble in the dark; I believe that’s the line verbatim. As a Filipino American, my sensitivity levels on jokes about Filipinos are pretty high. I just had an exchange with a relative in Tacloban in the Philippines about how people there didn’t have enough to eat. And how cemetaries were uprooted and dogs were chewing on the remains. The dogs weren’t being eaten by the starving typhoon victims. Of course, the movie was made before the typhoon occurred. But did they really need that line? There are enough genuinely stupid race-free laughs in the movie; it wasn’t necessary to update the already lame stereotype of Filipino dog eaters. It’s certainly one thing for a Filipino to joke about it. But to recycle it in a movie for a general audience is just plain racist, no matter how they update it by adding cats to the menu. Oh, and they made it an Olympic sport too. The Winter Games? So that would mean dog and cat, flash frozen, not fresh? For those who think I’m being too sensitive, how would you like it if the only time you hear your ethnicity mentioned in pop culture is as a punch line? Bad enough to be generally excluded from mainstream pop culture. The Filipino joke wasn’t the only ethnic joke in the movie. Burgundy (Will Ferrell) jokes about being Mexican a few times. But there, the joke’s on him. There was another joke about the news staff proposing a Chinese story. Burgundy hums a typical Asian ditty that’s usually accompanied by a gong, and then rejects the story. There again, Burgundy is the target. Perfect for humor of the stupid. But the Filipino dog-eating joke? 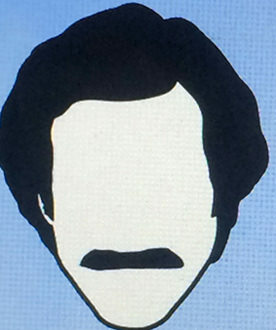 When you laugh, you’re not laughing at Burgundy. The target is Filipinos. Blacks, at least, were real participants in the movie. They were given their own lines to expose the stupidity of the Burgundian ebonics, the soul brother jive Burgundy brings to the dinner table of his African American girlfriend. The interracial love between Ron and the black news exec is actually kind of funny. When you make love and don’t see fireworks, but instead see images of Jackie Robinson and Gary Coleman and the cast of Diff’rent Strokes, well, I admit that’s funny. Once again, blacks were in on that joke, though even this area may make some people, especially whites like actual anchorwoman Megyn Kelly, a bit uncomfortable. After all, she still thinks Santa, Jesus, and news execs are all whites. The Filipino joke? It would have been nice to have a Filipino guy in a cameo to let Ron know it wasn’t cool. And coming from San Diego, known for a large Filipino American community in National City, the real fake Ron Burgundy should have known better. I stayed to the end, and even liked the surprise finish. Not the phony battle royal of news teams, but the movie’s sendup of bogus news, such as car chases and corporate conflicts. The movie needed more of that–satire that really hits the mark. Instead, it relies too much on the silly and stupid, making for fewer hits, more misses, and that racist clunker about Filipinos. Now, I’m not offended to the point of boycotting the whole thing. But on the Howard Stern show, Carell said if the movie made money (and really, is there any doubt of that? ), the cast and crew would all get together and have a big party concert with Seals and Croft or Hall and Oates. (The movie does use music to transport people back in time). I’d suggest they do one more thing. Make a donation to one of the charities, like Catholic Relief Services, that is continuing to help the victims of Typhoon Haiyan in the Central Philippines. It would be a perfect Ron Burgundy moment, live from Tacloban, or in the studio with a green screen and a big cardboard check. Such a small penance for a dog-eating transgression. And it fits right in with the filmmakers’ penchant for shameless self-promotion.